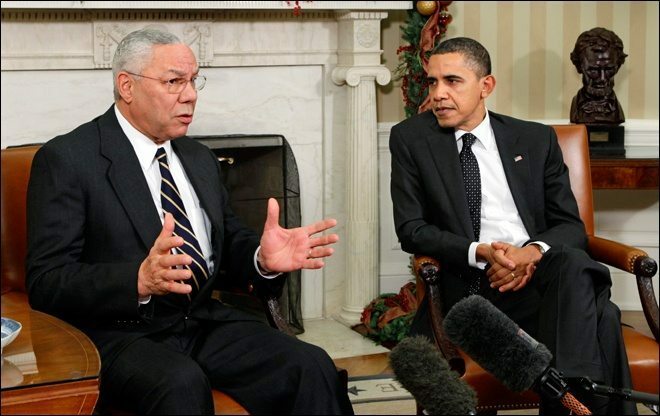 Colin Powell and his BFF Barry (Photo: Pinterest). As the old saying goes; if you lay with dogs, don’t be surprised if you get infested with fleas. Obviously, retired Army General, former Secretary of State, and alleged Republican Colin Powell didn’t get that particular memo. As the good folks at CNN are covering, the former SecState is pushing back hard against Clinton’s accusation that it was he who gave her the green light to set up a private email server. Powell made the comments at an event Saturday in East Hampton, New York on Saturday night, according to People magazine and the New York Post. He was responding to a New York Times report that revealed Clinton had told FBI investigators that Powell was the inspiration for her email set-up. The former Secretary of State under President George W. Bush suggested that Clinton was using private email long before he communicated with her about the subject. “The truth is, she was using (the private email server) for a year before I sent her a memo telling her what I did,” Powell said. But since the 2008 presidential election, the General has made a point of not only hobnobbing with members of the Jackass Party, he also made a very public jumping of the Republican ship. As CBS noted during the 2012 presidential cycle, Powell made a point of jumping on the Obama Bandwagon.